621. Distinction of parts. In the lowest of the Cryptogamic tribes the organs of vegetation and of reproduction are the same. Each cell in the structure grows, nourishes, multiplies. Higher in the scale we find a gradual specialization of organs, and in the higher tribes, as in the Phaenogamia, one portion is devoted to the preservation of the individual, the other to the preservation of the species; in other words, the organs of vegetation and of reproduction become separate and distinct. A Fern, Polypodium vulgare. 486, Its frond. 4S7, Lobe of the frond enlarged, showing the sori. 488. One of the tori (mag-nified) consisting of ninny sporangi. 489, One spor-ange (further magnified) bursting and distharging the spores. 490, A spore. 491, Spores beginning to germinate; and 492. 493, producing the prothallus with rootlets. At a appear the antheridia and at b the archegones on the surface of the prothallus. 494, Antheridium. 495, One of its cells. 496. The same burst; and 497, the spermatozoid escaped. These float about, and some of them at length enter. 49S, the arehegone. fertilizing and at length producing 499. the young Fern 500. Sorus of As-pidium mareinale. covered with the indusium. 501, Same, side view. 622. Distinguished from Phaenogamia. But the reproductive organs, although distinct from the nutritive, are never seen combined into flowers, nor producing seeds marked by the presence of an embryo. Hence in the scale of rank the cryptogams are inferior to the flowering plants and easily distinguished from them. 623. Vegetative organs. Again in the lower tribes, viz., the seaweeds, Fungi and Lichens, there is no distinction of root, stem and leaves; but the entire plant grows into an expansion of substance more or less uniform and indefinite, called a thallus. But the higher Hepaticae, mosses, club-mosses,Equisetaceae, ferns and marsileads, possess sterns, roots and leaves like the Phaenogamia. 502, Equisetum arvense. 503, E. sylvaticum. 504. Section of the spike. 505, A sporange. 506, A spore with its elators coiled. 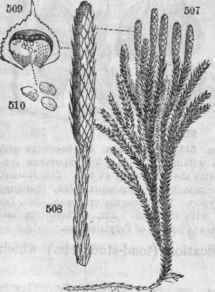 507, Lycopodium dendroideum. 508, A single spike. 509, a scale with its sporange bursting 510, Spores. 624. Classes. The tribe last mentioned are embraced in the class Acrogens, so named by Lindley from their manner of growth (akρov, point or summit), lengthening into an axis. The remaining three tribes first named above constitute the lowest class of the vegetable kingdom, called Thallosrens, and named from their manner of growth. 625. The stems of the marsileads and ferns are mostly rhizomes, but in tropical countries some species of the latter arise on firm serial trunks like palms. The club mosses have slender, woody stems much inclined to bifurcate. Those of the Equisetaceae, Characeae are jointed, bearing slender, whorled, leafless branches. The mosses and Hepaticae have filiform stems and branches, erect and creeping. Fern leaves and mushrooms arise on stipes. 511, Chara foetida. 512, Portion of a branch; the two reproductive organs-a, Globule; b, nucule. 626. Leaves. The ferns are characterized by their great development of leaves called fronds. They are rarely simple, often pinnatifid, or pinnate, simply, doubly or triply. Their venation is fork-veined and their vernation circinate. The leaves of the mosses and Hepaticae are veinless and delicate, mostly ovate and entire, numerously covering the axis. Those of the latter are often garnished with stipule-like processes called am-phigastria. 627. Thallus. The vegetative system of the Thallogens consists either of delicate filaments or of flattened membranes, varying in color through every shade and hue. In Marchantia, lichens, and seaweeds it is green, olive or red, and called thallus. It may resemble a leaf or a stem, but its functions are still the same. In size it varies from the microscopic Confervae to the gigantic seawrack, a furlong in length. Its structure is purely cellular and uniform, or, as in Marchantia, in layers. 628. Mycelium or spawn is the vegetative system of the Fungi, distinguished from thalli by its want of coloring matter in its cells. It consists of meshes of white or colorless filaments, branching and anas-tamosing to form entangled masses pervading the substance in which the Fungus grows. It is far less conspicuous than the fructification (toad-stool, etc.) which ultimately arises from it. 629. 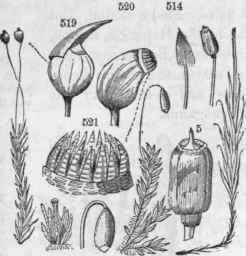 The reproductive organs of the Cryptogamia are the anthe-ridia and archegonia; and by their reaction spores in various spore-vessels are produced. They have been detected in nearly all the cryp-togamic tribes, and are supposed to represent the stamens and pistils of the flowering plants. 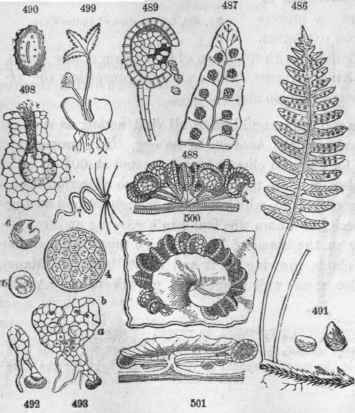 In the mosses, liverworts, etc., they appear only on the full-grown plant; in the ferns, Equisetaceae, etc., they appear only on the prothallus, the earliest growth of the spore, and here the archegone gives birth to an embryo, whence at length the true fern arises, while the prothallus dies away. Mosses. 513, Polytrichium. 514, Sporange with calyptra, without calyptra. 515, Sporange (enlarged) with the operculum at top. 516, Mnium, 517, Sporange. 518, Bartramia. 519, Sporange with calyptra. 520, Same mature, open. 521, Peristome, with its teeth. 522, Antheridium and paraphyses (a flower) of Polytrichium. Ilepaticae. 523, Marchantia, sterile plant. 524-5, Fertile plant. 526, Vertical section of the fertil-receptacle; 527, of a perianth, showing the sporange bursting. 528, One of the elators with four spores. 529, Portion of it highly magnified. 630. Spores. These are the true reproductive germinating bodies of the Cryptogams. They consist each of a single cell, often exceedingly minute, and produced in immense numbers. The cell wall of the spore may be simple (Botrytis) or double, as if a cell within a cell (ferns). But the spores are often apparently double or 2-celled (lichens), or 4-celled, or 6, 8, or many-celled. These compound spores are in fact spore-vessels inclosing several spores yet immature, and called sporidia or theca-spores. The spores or sporidia are often inclosed in still larger cells called the sac. 631. Endospores and exospores. Spores are developed either in the interior of the parent cell or on the outside of it, and hence the didivision of the Cryptogams into the En-dospores and the Exospores. In the latter case the parent-cells are called basidia, and many-such united, as in the lichens and mushrooms, form a tissue called hyme-nium. In lichens such sporiferous tissues existing in spots of definite form, constitute the apothecia when flat, receptacles when concave, and conceptacles when hollow. Fungi. 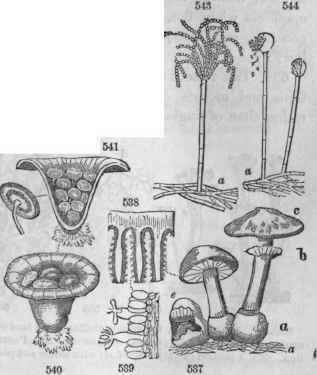 537, Agaricus (Mushroom) in various stages: e, tearing open the volva; b, annulus the remains of the veil (e); c, pileus; a, mycelium. 53S, Portion of the gills. 539, Basidia and spores from the same (magn. 400 diam.). 540, Cyathus; 541. Section. 542, One of the conceptacles. 543, Penicilium (mildew). 544, Mucor; a, mycelium. Seaweeds (Algae). 545, Vaucheria forming and discharging its spores (ft) at the extremities. 546, Fucus; a, air-vessel; b, fruit, a mass of conceptacles. 548, Transverse section of a conceptacle. 543, A spore with paraphyses. 549, Hydrogastrum, consisting of a single cell. 550, Spirogyrae (Frogspittle) one of the Confervae; a, two threads (thalli) conjugated, i. e., united by tubes. 551, Frustules of a Diatomaceous Alga (Diatoma marinum) separating from each other. Lichens, 530, Cladonia; the minute thallus at the base of the podetia, cup-like above, bearing scarlet conceptacles. 531, Usnea. 532, Sticta. 533, Parmelia. 534, Receptacle, vertical section. 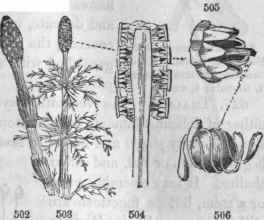 585, A portion (highly magnified) with thecae and paraphases. 536, A spore (double). 633. Zoospores and spermatozoids are minute bodies endowed with spontaneous locomotion in water by means of vibratile ciliae. Zoospores of ovate form proceed from the vegetative cells of the Algae, swim about for a time, then settle down and grow into new plants. Spermatozoids are mostly filiform bodies with several ciliae, discharged from the antheridia (as pollen?) and actively floating until they reach the arche-gones, or perish. 635. 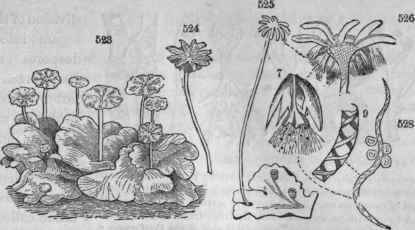 Other modes of propagation occur in these plants, as, for example, by innovations, sporules, gonidia. These bodies are analogous to bulbs and bulblets in the flowering plants, originating from the nutritive organs, and capable of separating from the parent and growing up independent plants. 552, Zoospore of one of the Conferva (Chaetophora). 553, Phytozoon of Chara. 554. Anthe-ridium of Fucus containing two phytozoa. 555, Zoospore of Conferva with a tuft of cilia. 556, Another species with but two cilia. 55T Zoospore of Vaucheria with cilia all around.